•	Load ranges from 70kg up to 4600kg per wheel. Brown polyurethane tyre on white nylon centred wheel with plain bearing. Diameter 80mm, tread width 30mm, bore size 12mm hub length 40mm Load capacity 100kg. Brown polyurethane tyred nylon centred plain bearing. Wheel diameter 100mm, tread width 30mm, bore size 12mm, hub length 45mm. Load capacity 150kg. Brown polyurethane tyre on white nylon centred wheel with plain bearing. Diameter 100mm, tread width 30mm, bore size 12mm hub length 40mm Load capacity 150kg. 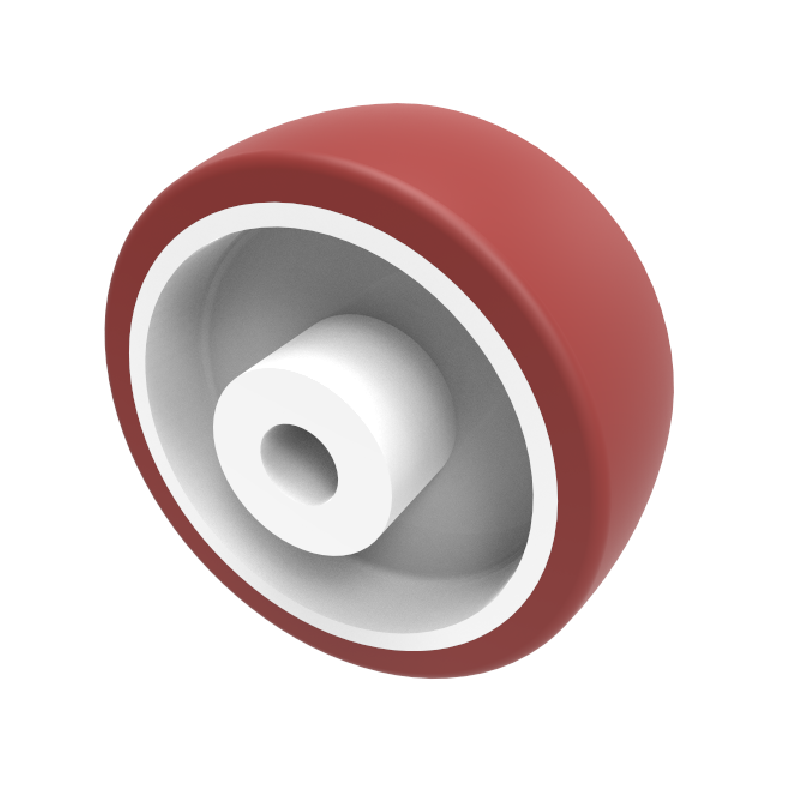 Red polyurethane wheel on a white nylon centre with a plain bearing. Wheel diameter 80mm, tread width 30mm, bore size 12mm, hub length 40mm. Loac capacity 200kg. Brown polyurethane tyre on white nylon centred wheel with roller bearing. 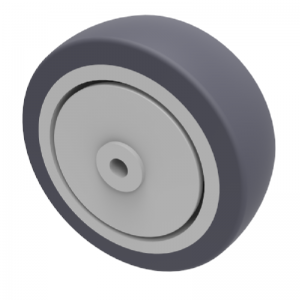 Diameter 80mm, tread width 30mm, bore size 12mm hub length 40mm Load capacity 100kg. Brown polyurethane tyre on white nylon centred wheel with a single ball bearing with retaining caps. Diameter 80mm, tread width 30mm, bore size 8mm hub length 41mm Load capacity 150kg. Brown polyurethane tyred nylon centred roller bearing. Wheel diameter 100mm, tread width 30mm, bore size 12mm, hub length 45mm. Load capacity 150kg. 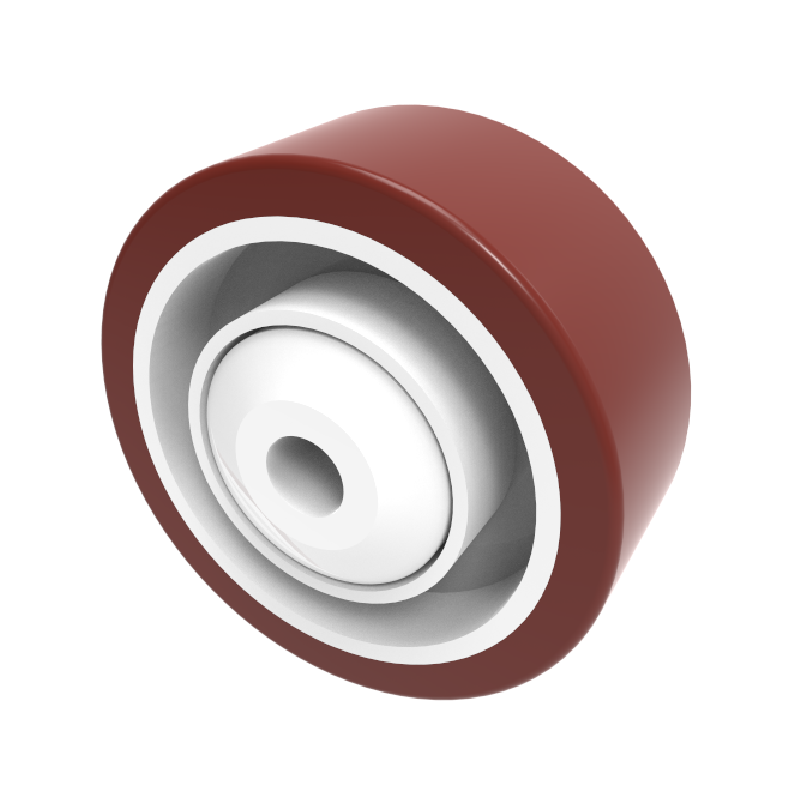 Red polyurethane tyred nylon centred plain bearing. Wheel diameter 80mm, tread width 33mm, bore size 12mm, hub length 45mm. Load capacity 210kg. 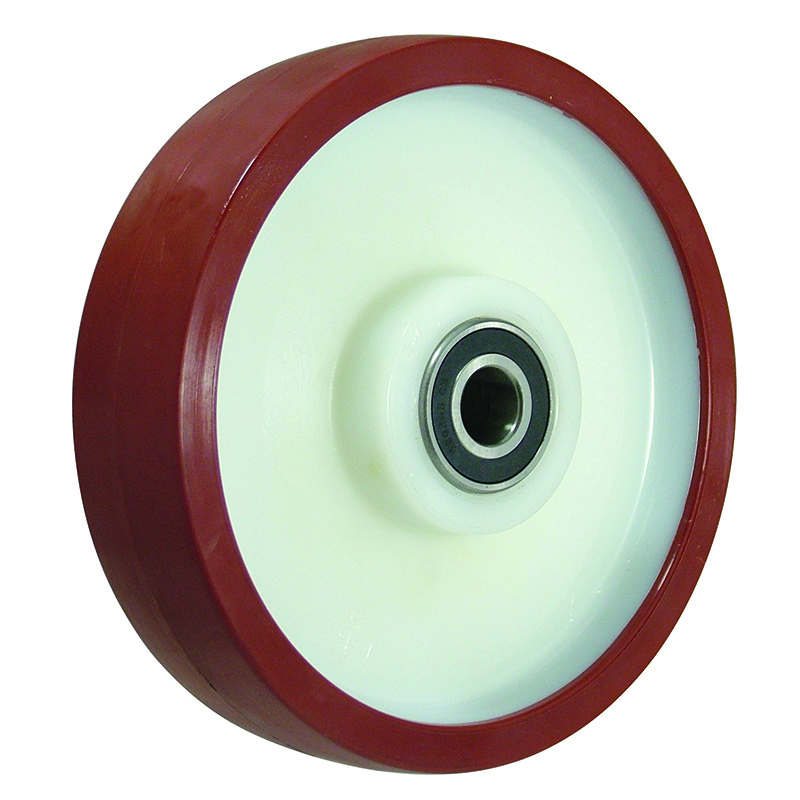 Brown polyurethane tyre on white nylon centred wheel with roller bearing. Diameter 100mm, tread width 30mm, bore size m12 hub length 40mm Load capacity 150kg. 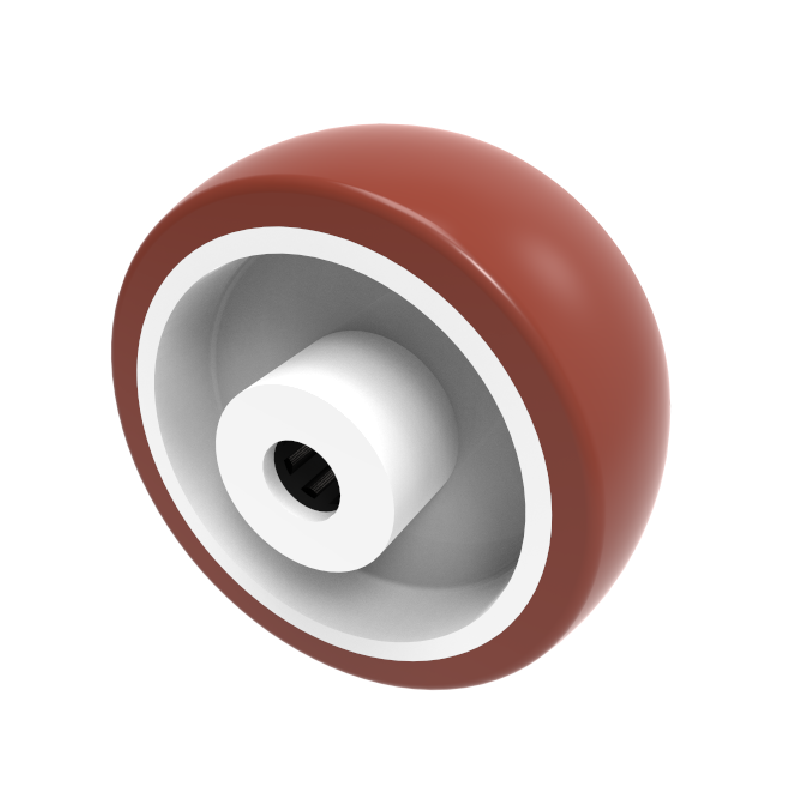 Red polyurethane tyre on white nylon centred wheel with a roller bearing. Diameter 100mm, tread width 33mm, bore size 15mm, hub length 48mm. Load capacity 250kg. Red polyurethane tyred nylon centred plain bearing. Wheel diameter 100mm, tread width 30mm, bore size 12mm, hub length 40mm. Load capacity 170kg. 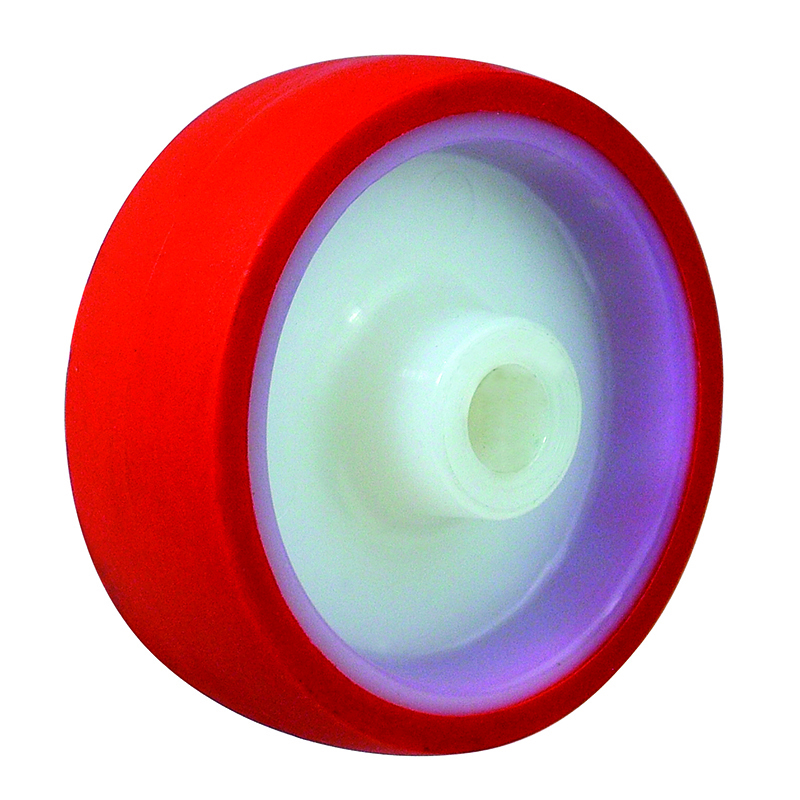 Red polyurethane tyre white nylon centred wheel with a rolelr bearing. Wheel diameter 80mm, tread width 30mm, bore size 12mm, hub length 40mm. Load capacity 200kg. Red polyurethane tyred nylon centred plain bearing. Wheel diameter 125mm, tread width 35mm, bore size 15mm, hub length 48mm. Load capacity 300kg. 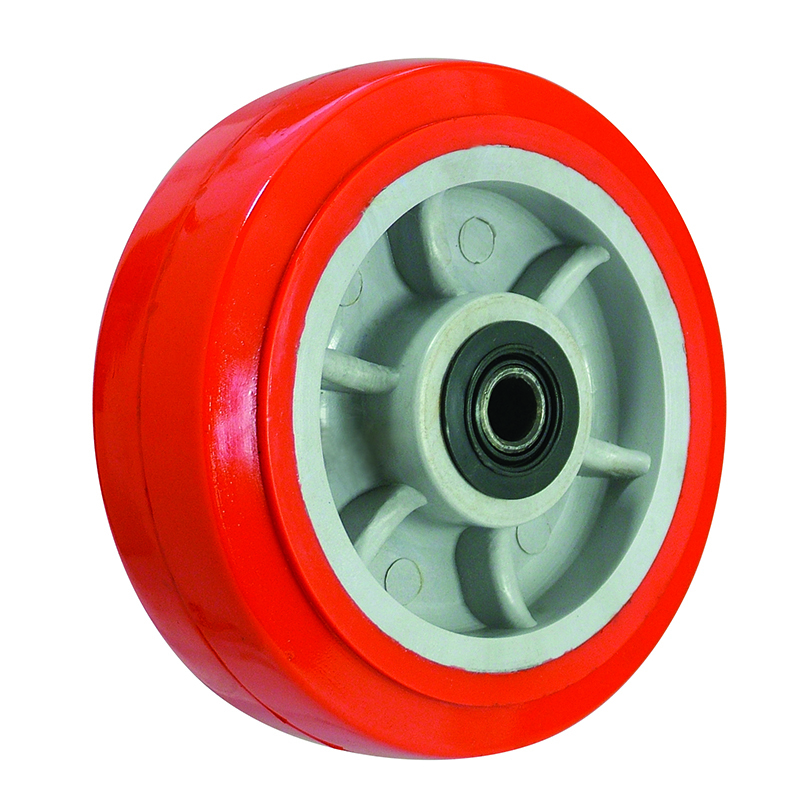 Red polyurethane tyre on white nylon centred wheel with roller bearing. Diameter 125mm, tread width 35mm, bore size 15mm, hub length 48mm. Load capacity 300kg. Brown polyurethane tyre on white nylon centred wheel with plain bearing. Diameter 125mm, tread width 35mm, bore size 15mm hub length 45mm Load capacity 200kg. Brown polyurethane tyre on white nylon centred wheel with a single ball bearing with retaining caps. Diameter 100mm, tread width 35mm, bore size 8mm hub length 41mm Load capacity 200kg. Red polyurethane tyred nylon centred roller bearing. Wheel diameter 80mm, tread width 33mm, bore size 12mm, hub length 45mm. Load capacity 210kg.